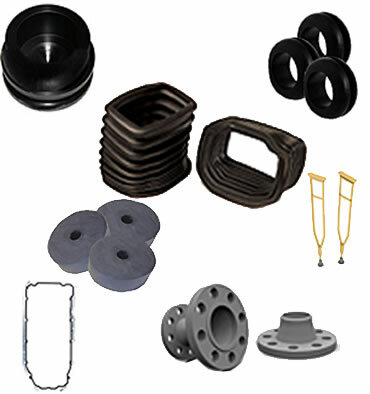 Monroe Seals is a direct manufacturer and supplier of custom molded rubber parts. Custom Molded parts are very design specific and our molding processes include: injection, transfer, and compression molding to accommodate any size or volume requirements. We have decades of experience providing customers with custom molded parts that are unique to their application. Our custom molded part experience incorporates the certification of the material within the confines of each specification, while meeting and overseeing necessary quality reports. The Compression Molded Rubber Parts process is typically used when an application calls for high quantities in production runs, medium shore in durometer or hardness, or if the material call-out is one that requires less common, but more expensive materials. An excess of your chosen material is placed into the cavity of the mold to guarantee total cavity fill. Heat and pressure are applied, which causes the rubber compound to flow and fill the cavity, with any overflow going through the overflow grooves. This overflow, or flash, can be a concern when the parts are of critical dimension, larger diameter or of a more expensive variety of a rubber compound. Compression molding reduces the amount of flash created in the molding process. Further reduction of this flash on your custom molded part is done in the deflashing process for any type of molding you may choose. Depending on your parts specifications, this deflashing is done either by tear trimming, tumbling, grinding or cryogenic deflashing. Are you looking for Molded Parts?